AMA Computer University (Filipino: Pamantasang Pangkompyuter ng AMA), using the trade name AMA University (Filipino: Pamantasan ng AMA), is the first ICT university in the Philippines and in Asia. The university serves as the flagship brand of the AMA Education System (AMAES). "Never Rest On One's Laurels"
AMA University is located on Maximina Street, Villa Arca Subdivision, Barangay Baesa, Project 8, Quezon City, Philippines. It specializes in electronic, information, and communication technologies. It follows a trimestral calendar where a typical four year collegiate education program under a semestral calendar is completed in 3 years. AMA University and its sister school AMA Computer College (AMACC) were founded by Amable R. Aguiluz V, who named them after the initials of his father's name, Amable Mendoza Aguiluz Sr. Aguiluz saw the demand for fully trained computer professionals in the country. However, no institution in the country offered computer education to professionals at that time. Aguiluz founded the AMA Institute of Computer Studies with the first computer school located along Shaw Boulevard on 20 October 1980. Back then, AMA Institute of Computer Studies offered only short-term courses in Electronic Data Processing Fundamentals, Basic Programming, and Technology Career. Three students enrolled at the AMA Institute of Computer Studies during the first semester. AMA Computer College came into existence in June 1981. It extended its services through a four-year Bachelor of Science degree in Computer Science. With only a handful of students in its first year of operation, the AMACC student population rose dramatically from 600 in 1983 to 2,000 in 1985 on its first official campus in Makati City. Shortly after, it established its main campus in Quezon City. Two provincial campuses were then founded in Cebu and Davao City. With the passage of the Philippine Republic Act No. 7722 or the Higher Education Act of 1994, privately controlled educational institutions' academic fees were deregulated. AMA increased tuition fees then solved the problem of low student population by embarking on a marketing, advertising, and information campaign. The emergence of AMACC led to the birth of AMA Computer Learning Center (ACLC) in 1986 and AMA Telecommunication & Electronic Learning Center in 1996. The former offers short-course programs for professionals and two-year technical/vocational courses for those who wish to acquire employment skills. The latter is one of the first schools in the Philippines to concentrate on telecommunication, electronics, and related technologies. It was the first school in the country to fully integrate the Internet into its curriculum. Since 1987, all major AMA colleges have been interconnected through a local area network (LAN), which converted them into one nationwide school system. In 1991, Aguiluz gained accreditation for AMA Computer College in the American League of Colleges and Universities (ALOCU), making AMA the first Filipino and non-American school to do so. AMACC became an official member of the John F. Kennedy Educational Institute in Japan. AMACC is accredited by the National Computing Centre United Kingdom as well. AMACU's Quality Management System has been ISO 9001-certified since March 1999 by Société Générale de Surveillance International Certification Services Canada, Inc.
AMA Computer College of Quezon City became AMA Computer University following the conferment of university status by the Philippine government's Commission on Higher Education (CHED) on 20 August 2001. In 2003, AMA Computer University inked a partnership with Carnegie Mellon University's iCarnegie to use its curriculum and courses through e-learning. Previously, ICarnegie had approached STI for the agreement, but opted to stick with AMACU instead. As stated by iCarnegie President and CEO Allan Fisher, "the academic relationship between STI and iCarnegie went well, the business side of the agreement did not go as planned". 12 years after its elevation as university, AMA tapped Hewlett-Packard Philippines for the development and implementation of software testing academic subjects of its Information Technology degree course. The Philippine Commission on Higher Education (CHED) did not accredit other AMA campuses to use the title "University" and only permitted to use the title of "College" or "Institute" as these campuses have not met the requirements needed by the Philippine academic regulatory body. In 2003, AMA Education system brokered a partnership with the government of Bahrain to establish the AMA International University in Manama. AMA University began to offer the "very first and only full online platform offering full degree programs in the Philippines" through online-based education system, where learning materials are all accessible in their online portal 24/7. According to AMA, "As a dominant provider of holistic, relevant, and quality IT-based education, AMA University Online Education aims to educate every Filipino and anyone in the world who needs access to education in any region, in different timezone hence producing professionals and leaders that will be responsive to the developments of technology and the international community." The university began offering their flagship CHEd and Level 3 PACUCOA accredited Bachelor of Science in Computer Science and Bachelor of Science in Information Technology for their online learning platform, enabling access to education without going to the actual school, accessing learning materials through the PC, tablet or smartphone, at the student's own pace. Every trimester in AMA University Online lasts for 14 weeks (eq. to approx. 3 months) but with no definite start date; which means once enrolled, the student may start right away and finish the degree within a 14-week duration. The student will no longer be late as they could access the lessons and even take assessments on their most convenient time, at their most convenient place. Due to the "overwhelming response" of the Philippines market especially by the Overseas Filipino Workers (OFWs), AMA University Online Education has partnered with the world's leading content and training providers such as Lynda.com (a Linkedin Company), McGraw Hill Education, Microsoft Virtual Academy, among others. In 2001, AMA joined the newly created National Athletic Association of Schools, Colleges and Universities (NAASCU). The AMACU Titans had a rocky start but in 2006, they beat their corporate rivals, the STI Olympians and became the 2006 NAASCU Champions. It participates in the Collegiate Champions League, composed of top ranked varsity teams in the Philippines outside of the UAAP and the NCAA. Dataline, the official student publication of the university, has an office on the 2nd floor of the college building, releasing an issue each term. It is one of the two official student organizations of the university, the other being the Student Council (SC). Amable Aguiluz V was Joseph Estrada's political endorser in the 1998 Presidential elections. Aguiluz resigned from the Commission in November 1999 due to a controversial purchase of equipment by the commission from a subsidiary of the AMA Group of Companies. Aguiluz's father Amable Aguiluz Sr. was Diosdado Macapagal' s friend and Aguiluz Sr. served as Chairman and Auditor-general of the Commission on Audit in the 1960s. Arroyo was invited to AMA's sponsored political rallies. In 1995, Arroyo attended a political rally in AMA when she ran for re-election as senator. Arroyo attended all graduation rites for AMA from 2002 to 2005. Arroyo cited AMA for not participating in cause oriented and student activist groups. Arroyo appointed Aguiluz as Presidential Adviser for the Middle East. First graduation ceremony as a University in Quezon City, May 2002. AMA Computer University also has pre-school, elementary, and high school programs under the brand St. Augustine International School (now AMA Basic Education). The AMA Education Group is planning a campus named University Town. Expected to be completed in celebration of its 40th year, the AMA Computer University Town is a 50-hectare property in Ara Vista Village in General Trias, Cavite It draws its inspiration from old universities in the western world that spurred rapid development in the Host Township. The University Town will serve as another type of multi-use development, a primary institutional complex in a park-like setting. A network of open space and walkable distances from once destination to the other is laid out to encourage users to walk instead of using vehicles. The AMA Education system has sister schools. Unlike the Quezon City campus, whose land is wholly owned, some of the campuses are on rented real estate. The campuses are overseen and monitored by government departments, such Department of Education (DepEd), Technical Skills and Development Authority (TESDA), Commission on Higher Education and the Philippine Maritime and Naval Agency (MARINA), for Norwegian Maritime Institute. Student population mainly determine the longevity of the campuses. Only the main campus of AMA, in Project 8, is accredited with a University status; all else are under study for proper accreditation. Pursuant to TESDA compliance, the school offers ladderized education as well, a program that allows vocational students to pursue college easily, having their previous vocational course merits credited into their college curriculum. AMA Computer College (doing business as AMA Colleges) are educational institutions across the Philippines that offer the same programs as AMACU. 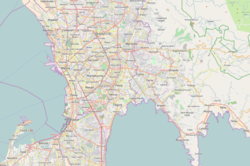 The campuses in Caloocan, East Rizal, Makati, Las Piñas, Malolos, Biñan, Pasig, Bacolod, Fairview, Capiz, Cebu, Cagayan de Oro, Davao are among these. [[AMA International University]] is a partnership between the Kingdom of Bahrain and AMA Education System serving AMA's ICT programs in the Arab Region. AMA Computer Learning Center (ACLC College) are educational institutions across the Philippines that has a similar structure as AMA Computer College but only offered short Information Technology-related programs before. These programs range from Certificate (3-month), Diploma (1 year) to Associate (2-years). It uses a semestral (5-month) academic calendar. However, they are now offering 4 year courses as well. St. Augustine School of Nursing are educational institutions across the Philippines that has a similar structure as AMA Computer Learning Center but only offer short Medical-related programs like caregiver course. ABE International Business College are educational institutions across the Philippines that has a similar structure as AMA Computer Learning Center but only offers short business-related programs like e-Commerce Management. AMA International Institute of Technology (CLOSED) are educational institutions that have a similar structure as AMA Computer Learning Center but only offers short technology-related programs like radio technician course. Formerly AMA Telecommunication & Electronic Learning Center, it is located in EDSA, Cubao, Quezon City. Norwegian Maritime Academy are educational institutions across the Philippines that offer the same programs as AMACU. It focuses only in Maritime-related courses like Marine Engineering. AMA School Of Medicine are educational institutions across the Philippines that offers the same programs as AMACU but is under study for accreditation or recognition by the Commission on Higher Education. It focuses in Medical-related courses like Nursing. The Doctor of Medicine or MD course is offered in the Makati Campus of AMA. This is an intensive 4-year course which has been operational since 2008. AMA Basic Education (Formerly St. Augustine International School) are educational institutions across the Philippines that offer pre-school, elementary, and high school programs but is housed outside AMACU. The institution also claims utilization of the GEMS program for their Math curriculum. Delta Air International Aviation Academy is an educational institution that offer studies in aviation. Its campus is located in the Old MIA Road in Parañaque and flight training area is located in Plaridel, Bulacan. Like other educational institutions, AMA has its share of controversies. Primarily, an incident in the educational institution became the main cause of the country's upgraded cybercrime laws, as explained below. In 1999, AMA Computer College Makati student Onel de Guzman submitted a thesis proposal for the creation of a computer program that will hack into computer systems and extract vital information, particularly Internet Service accounts. The proposal was unanimously rejected by the College of Computer Studies' academic board. De Guzman was scheduled to complete his studies in 2000 and an academic subject called "Thesis A" was one of his final requirements before graduation. After commencement day on 3 May 2000, an e-mail trojan called "ILOVEYOU" spread internationally and caused delays in several online transactions. The ILOVEYOU virus unleashed a flood of e-mail that hit at least 45 million users in at least 20 countries according to one estimate. The virus started with "ILOVEYOU" in the subject line, but several variations appeared soon afterward, including one masquerading as an e-mail joke and another as a receipt for a Mother's Day gift. The virus both replicates itself and steals the user names and passwords of unsuspecting victims. The e-mail replies from angry virus recipients to the creator passed through the United States e-mail address "isp-adm@mail.com", which then forwarded them to the two Access.Net (Philippine Internet Service Provider) e-mail accounts used by the virus creator - "spyder@super.net.ph" and "mailme@super.net.ph". According to Guinness World Records, the ILOVEYOU virus was the fastest-spreading computer worm until the release of Mydoom in 2004. The virus was traced to an apartment room in downtown Manila where De Guzman was residing. De Guzman was invited by the National Bureau of Investigation (NBI) for questioning, and in an interview, admitted spreading the virus "by accident". In response, AMA expelled de Guzman from AMA Makati and considered him a "drop out" for life. The NBI charged De Guzman for violation of Republic Act 8484 or the Access Devices Regulation Act oF 1998. However, due to lack of sufficiency, the justice ministry dropped the charges as there was no clear legislation regulating the Internet. As a result of the incident, President Joseph Ejercito Estrada signed into law Republic Act 8792, known as the Philippine Electronic Commerce Act of 2000 on 14 June 2000. 1) The Congress and Senate are just wasting money and time in their investigations regarding jueteng and the Garci tapes, 2) The opposition does not have a clear plan for the country. Its only objective is to bring down the current administration,[clarification needed] 3) Often, news on television, on radio and in newspapers are purely negative and are no longer helping the country, 4) In spite of the accusations being hurled against Pres. Gloria Macapagal Arroyo, she still continues to implement good reforms. On the third test statement, 41% of Filipinos agree, while 29% disagree, and 28% are undecided. The net agreement is +12, indicating a slight agreement. On the last test statement, 37% of Filipinos agree, 34% disagree, and 26% are undecided. The net agreement (% agree minus % disagree) is +3, indicating a split opinion. On 23 January 2007, the Supreme Court affirmed the decision of the NLRC regarding the dismissal of a high school principal. A high school principal was promoted on 13 May 1996 but an incident four days later led to her dismissal. A cashier at the company, carried a brown envelope containing PhP 47,299.34 to the comfort room of the school. While inside, she placed the envelope on top of the (toilet bowl) tank. After she left the room, she realized the envelope was left behind, hence she returned to the comfort room, but the envelope was already gone. The incident was reported to the area director, who told that the only person she recalled entering the comfort room after her was the school principal. Investigation of the school principal was ordered. Thereafter, she was brought to the barangay office and the incident was entered in its blotter. On 20 May 1996, she was suspended. School officials served the principal several notices to appear during the hearings and to submit her written explanation, but the hearings were always cancelled. On 19 June 1996, AMA dismissed the principal on the ground of loss of trust and confidence. On 21 June 1996, school officials sent her another notice directing her to appear on 27 June 1996 hearing and to submit a written explanation. The hearing was, again, cancelled. On 1 July 1996, AMA finally terminated her employment. On 14 August 1996, Garay filed a complaint for her dismissal and on 14 September 1998, NLRC Labor Arbiter Eduardo Carpio rendered judgment. He ruled that there was no material and direct evidence to show that the employee took the collections. NLRC ordered AMA to immediately reinstate her to her former or substantially equal position and pay her backwages computed in the amount of P300,000.00 (1 July 1996 to 31 December 1998 = 30 months. P10,000.00 x 30 months = P300,000.00), moral damages of PhP 100,000.00 and exemplary damages of PhP 50,000.00. On 10 November 2004 the Regional Trial Court dismissed the case against 48 students and granted the students' motion to discontinue the proceedings after getting assurance from the school administration that they can continue with their studies. The students were ordered dismissed by school management 4 October 2004 for holding a protest rally in front of the school. The students were dismissed from the school by the area director, school director and the school's disciplinary board after they held a protest rally in front of the school campus without the necessary permit. They said that the dismissal of the students was based on a resolution dated 9 October issued by Student Disciplinary Tribunal, which states that holding of rallies or any related activities without the necessary permit from an authorized school officer is a major offense that merits dismissal as provided for in the student handbook. The students filed a 13-page civil suit with damages against the school for dismissing them. They also claimed their dismissal was null and void and violates their freedom of expression as enshrined in the 1987 Philippine Constitution. They said they held the rally to show support for the preventive suspension of several regular teachers, the implementation of the webcast teaching system and other unresolved issues regarding miscellaneous fees. The students were accompanied by police authorities in going back to school. Daniel Padilla, a local actor, signed as AMA University's fifth advertisement endorser. AMA then joined as an expansion basketball team to the 2014-2015 season of the PBA Developmental League and Padilla was selected by AMA as its final round draft pick. Many spectators in the draft event at the PBA head office in Libis, Quezon City were surprised with the selection as Padilla was not part of the 153 players who submitted their application for the draft. AMA invoked its right as a school-based team to sign a player who hasn't applied for the draft. Padilla's professional handler, ABS-CBN's Star Magic denied reports Padilla was allowed to join the league and it was done without their prior knowledge. AMA claimed that Padilla was enrolled by the university as a freshman for the course Information Technology. Padilla responded to news reporters and stated that it was much of his surprise that he was drafted without his prior knowledge and declined to join the basketball league. AMA Education System official website. AMA Education System Alumni Association Inc.
^ "The Quest for Quality". Archived from the original on 24 October 2009. ^ Oliva, Erwin and Joel Pinaroc. STI sues AMA over iCarnegie row. From INQ7.net, via Philippine Science and Technology Portal. 15 May 2003. Retrieved on 6 August 2007. ^ "AMA hooks up with HP to include software testing in IT courses". ^ CCL 4th Collegiate Champions League Archived 26 November 2006 at the Wayback Machine. (Commercial website). Retrieved on 6 July 2007. ^ Suh, Sangwon and Antonio Lopez. "Hail to the New Chief: President-elect Joseph "Erap" Ejercito Estrada is already beginning to put his own stamp on the nation. Most are pleased about it - but not all". Archived from the original on 14 October 2006. . Asiaweek.com, 26 June 1998. Retrieved on 6 July 2007. ^ PGMA's Speech during the 23rd AMA Computer University Foundation Day and Education Computer College Celebration: AMA Computer University Gymnasium Villa Arca, Project 8, Quezon City (12 Nov. 2003) Archived 9 October 2006 at the Wayback Machine. (Speech transcript). Office of the Press Secretary, Republic of the Philippines, 12 November 2003. Retrieved on 6 July 2007. ^ GMA lauds AMA education system's role in moulding 'Filipinos of the future' Archived 30 September 2007 at the Wayback Machine. (Press release). Office of the Press Secretary, Republic of the Philippines, 4 May 2004. Retrieved on 6 July 2007. ^ PGMA's Speech during the First Commencement Exercises of AMA Computer University' Archived 14 March 2008 at the Wayback Machine. (Press release). Office of the Press Secretary, Republic of the Philippines, 3 May 2002. Retrieved on 7 February 2008. ^ "Office of the Special Envoy - Republic of the Philippines". Gcc-envoy.gov.ph. Archived from the original on 18 January 2012. Retrieved 17 January 2012. ^ "Page B7, March 14, 2003, Philippine Daily Inquirer". Makati, Philippines: Philippine Daily Inquirer. 14 March 2003. Retrieved 23 September 2013. ^ Onel de Guzman's rejected thesis proposal at AMA Computer College Archived 2010-04-26 at the Wayback Machine. (Personal website, Richard M. Smith). Computerbytesman.com. Retrieved on 6 July 2007. ^ Guinness World Records Ltd. (2000). Guinness World Records, 2001. London, United Kingdom: Mint Publishers Inc. p. 119. ISBN 1-892051-01-X. ^ "Hacking Takes a Holiday: The Love Bug suspect is talking but not confessing". Archived from the original on 16 May 2006. . Asiaweek.com, 2000-10-13, Vol. 26, No. 40. Retrieved on 6 July 2007. ^ Cohen, Adam. School for Hackers. Time, 14 May 2000. Retrieved on 6 July 2007. ^ "SWS Media Release: 18 April 2006". Sws.org.ph. Archived from the original on 7 April 2012. Retrieved 17 January 2012. ^ "Sun.Star Davao - Court dismisses case against AMA students". Sunstar.com.ph. Archived from the original on 11 February 2009. Retrieved 17 January 2012. ^ "Teen hearttrob Daiel Padilla drafted into PBA D-league". GMA News. 15 September 2014. Retrieved 31 January 2016. ^ Terrado, Reuben (15 September 2014). "Popular teen actor Daniel Padilla named to AMA Titans lineup in PBA D-league". Spin. Retrieved 31 January 2016. ^ Sancon, Allan (15 September 2014). "Daniel Padilla named to AMA Titans lineup in PBA D-league". PEP. Retrieved 31 January 2016. ^ Terrado, Reuben (15 September 2014). "Teen actor Daniel Padilla denies plan to play for AMA Titans in PBA D-league". Spin. Retrieved 31 January 2016. ^ "i-Site.ph". Manila, Philippines: iSite.ph. 1 July 2004. Retrieved 23 September 2013.